. Published on 25/10/2017 . We’re already converts to our RHS membership so we’d thought we’d share with you our seven reasons why an RHS membership is the season’s gift to yourself or that someone special in your life. As an RHS member you’ll get free unlimited access for you and a friend / family member to RHS Gardens and free entry to over 195 Partner Gardens across England. Your friends and family will be falling over you to get to see the wonders RHS Wisley housing one of the largest plant collections in the world or take tea at Betty’s at Harlow Carr and take in all four glorious seasons. If anyone knows how to put on a show it’s the RHS and of course it gives you an excuse to add a touch of garden glamour to your wardrobe on an exclusive RHS member only day. You can even enjoy savings on public days. We challenge you not to be inspired by the fabulous flower displays and jaw-dropping garden design. Check out the exclusive GardenTags MeetUp on our favourite RHS show flower garden. The RHS has a team of horticultural oracles at an RHS member’s disposal. Their experts can answer your questions in person, over the phone or by email. We all need a helping hand at some point and to know someone’s there to give you personalised advice makes us feel that we’re not growing it alone. 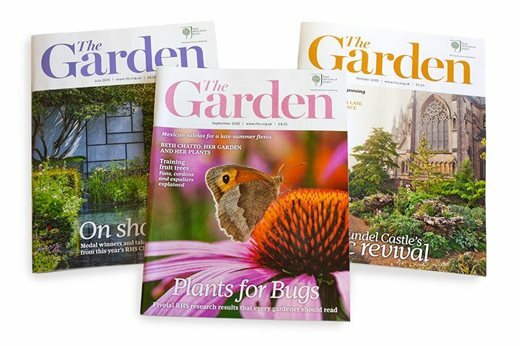 Discover a world of horticulture with The Garden magazine. Read articles on practical gardening, plants & advice along with information on events & shows and celebrating the RHS. It’s worth £54 per annum but you get it free every single month as part of your RHS membership. The RHS is on a mission to enrich everyone’s life through plants, and make the UK a greener and more beautiful place. We second that motion, the more people that can be encouraged to get outside growing the better for them, us and our environment. If you’re a member of GardenTags you get to meet fellow growers at the RHS Gardens at our GTMeetUps. With an RHS membership you’ll be able to get into the RHS Gardens completly free. So what are you waiting for? Sign up today for an RHS membership for yourself or why not gift it to that someone special. This blog is part of our Growing Stories guest blog series. If you have a story to tell please email us on hello@gardentags.com to find out how to take part. Here’s the official disclaimer bit… The views, opinions and positions expressed within these guest posts are those of the author alone and do not represent those of GardenTags. The accuracy, completeness and validity of any statements made within this guest blog post are not guaranteed. We accept no liability for any errors, omissions or representations. Daniel Richards on What Spring Flower Are You? I got Tulip. Apparently, I'm cheerful and always give sound advice... I reckon that's about right! You have a real talent, Justin! I have seen both gardens your created, and the planting is fantastic! I have patches on my lawn and they are spreading...shiny black like paw prints with lighter coloured round patches,what is it? Download the FREE GardenTags App to get your people powered planting fix.